Bananas are the fruits of the banana tree (Musa sp.). Bananas grow in bunches with a varying number (up to 200) of "fingers" each. Depending on cultivars and landraces, bananas are 6-35 cm long, green, yellow, red or brown, cylindrical or angled, straight or curved, and seeded or seedless (Ecoport, 2010; Ecocrop, 2010, Espino et al., 1991). The banana is picked green and ripened in sheds. It has been estimated that 30% to 40% of the total banana production are rejected for failing to meet quality standards, and are potentially available to livestock (Babatunde, 1992). In exporting countries, particularly in Latin America and Asia, bananas are rejected for being damaged and for being under- or over-sized. In countries where consumption is local, notably in Africa, only the fruits fully unfit for humans may be given to animals. For this reason, plantains are rarely used to feed animals and most of the scientific literature deals with bananas. Note: in the rest of this datasheet, the term "banana" will be used as a generic name for both bananas and plantains, except when the term plantain is specified. All classes of livestock can be fed bananas and plantains. The fruits can be used fresh or dehydrated, raw or cooked, green (immature) or ripe (mature), with or without peels, whole or sliced. Fresh bananas may be ensiled with molasses, grass, legumes, rice bran or any product that may increase their feeding value (Babatunde, 1992). Another banana-based feed product is the banana pulp flour, which is made of peeled, dried and milled fruits (Le Dividich et al., 1978). The banana fruits used to feed animals are a by-product of banana production and are usually available in the vicinity of banana fields and processing plants. They can be found in all tropical and subtropical regions of Asia, America, Africa and Australia where bananas are grown. For more information about the distribution of bananas, see the Banana (general) datasheet. Green bananas are easier to dry than ripe ones (Babatunde, 1992). Drying green bananas does not alter significantly the quality of the product. Dried banana pulp can be ground into banana pulp flour but this process is expensive (about 68 kg of fuel oil or 25 kWh per tonne of fresh material) and it is usually justified only for feeding pre-ruminant calves or piglets (Geoffroy, 1980; Le Dividich et al., 1978). Bananas are perishable and cannot be stored for a long time in their fresh form. Ensiling is a low-cost option that can help to preserve bananas, when they are abundant, for periods of feed scarcity (Le Dividich et al., 1975; Sève et al., 1976). Bananas are easy to ensile and no additives are required. The silage stabilizes in three to four days and keeps for at least six months. 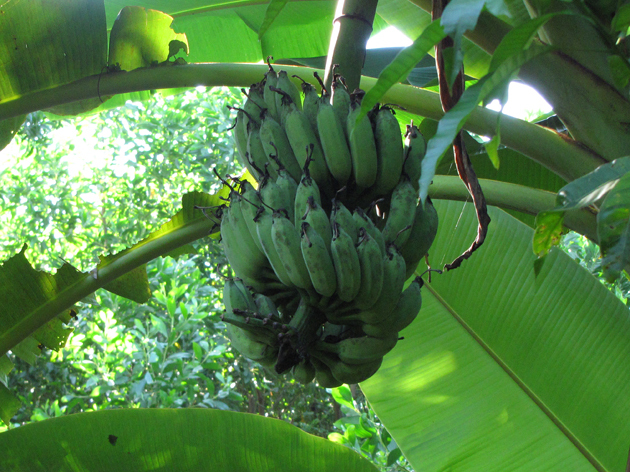 Green bananas should be chopped before ensiling as they compact less easily than ripe bananas. Silage made from green bananas loses less dry matter (10-15%) than silage made from ripe bananas, because most of the simple sugars in the latter are degraded or disappear, whereas starch losses are limited. Although ripe fruit silage may have a more favourable pH and lactic acid content than green banana silage, the latter is to be preferred, particularly when sudden peaks occur in banana supplies owing to seasonal factors, market constraints and meteorological conditions (Le Dividich et al., 1978). See the Banana (general) datasheet. Bananas are a source of energy as they contain mostly non-structural carbohydrates (85-93% DM). The composition of bananas is determined by their degree of ripeness. In the immature fruit, starch is the main carbohydrate (65-75% DM) and ripening transforms it into solubles sugars, particularly sucrose (about 2/3 of the sugars), glucose and fructose. Fully mature fruits can contain more than 70% sugars. Fresh bananas are rich in water (70-80%). Bananas have low concentrations of crude protein (5-6% DM), ether extract (1-3% DM) and minerals (2-4% DM). Crude fiber content is also low (3-5% DM). The peels account for 18-23% of the dry matter and contain more crude fibre, so removing them decreases the crude fibre down to 0-3% DM (Ly, 2004). Bananas are poor in lysine and sulphur-containing amino acids (Pérez, 1997). Tannins are the main antinutritional factor of bananas and are mostly contained in the peels. Ripening causes these tannins to disappear (or their transformation into inert forms). In addition to their antinutritional effects, particularly in monogastrics, banana tannins are responsible for the astringent taste of immature fruits, making them less palatable than mature fruits (Ly, 2004). Bananas are relished by cattle but are less palatable to sheep and goats (Göhl, 1982). They are usually fed fresh or ensiled and may be sprinkled with salt to supplement them with sodium (Babatunde, 1992). Banana fruits are a suitable source of energy for ruminants, with a net energy value close to that of barley (Pieltain et al., 1998). However, because they are low in fibre, protein and minerals they should be fed together with grass or another roughage as well as a protein supplement (or a nitrogen source such as urea) and mineral mix. Good silage can be made from equal parts of chopped green bananas and grass or from chopped green bananas mixed with 1.5% molasses (Göhl, 1982). Banana fruits may be included in cattle diets at up to 50-75% (Göhl, 1982). When properly supplemented with a nitrogen or protein source, or when associated to a basal diet (cereal grains, leucaena forage, urea-treated sugarcane, etc. ), reject bananas can sustain acceptable performance levels in beef cattle (Reynolds, 1995). Feeding 15 kg/day of fresh green bananas to grazing steers increased the daily gain by 50% (from 0.4-0.5 kg/day to 0.6-0.7 kg/day), which was attributable to the high energy content of the banana (Ibrahim et al., 2000). Feeding fresh bananas to grass-fed steers made it possible to increase the stocking rate, and improved growth rate and weight gain per hectare (Cubillos, 1974). In growing heifers, the inclusion of dried milled banana was found economically viable up to 1 kg/day (0.36% of live weight), but higher rates decreased weight gain (Vargas-Rodriguez et al., 2007). Banana pulp flour made from dehydrated green bananas has been used as a source of starch for calf feeds and milk replacers as a substitute for lactose. Banana flour could successfully replace up to 50% of the grain in the feeds of young growing and finishing cattle without altering intake and daily gain (Babatunde, 1992; Le Dividich et al., 1978). Because they are palatable and have a high energy contentration, green banana fruits are a suitable feed for goats, who can consume up to 5 kg of fresh bananas per day (Pieltain et al., 1998). When goats were offered ad libitum bananas and forages separately, the animals consumed bananas at about 20-40% of their DM intake. When bananas were blended with forages, DM intake and digestible OM intake increased when the level of bananas in the ration rose from 0 to 20% (DM basis). Dry matter intake was higher for ensiled than for fresh green bananas, with a peak of 1.8 to 2.2 kg/100 kg live weight at a 20% inclusion rate in the diet (Chenost et al., 1971; Geoffroy et al., 1973; Chenost et al., 1976). In lactating goats fed sobyean meal and cereal grains, the total replacement of grains by fresh or ensiled bananas resulted in an increase of DM intake. Milk production and weight gain were significantly higher in the animals fed bananas (Le Dividich et al., 1978). In growing goats, half of the conventional concentrates could be replaced with bananas if the ration is supplemented with urea (non-protein N could constitute about 30% of the total dietary N) (Chenost et al., 1971). For both milk production and finishing purposes, bananas may be regarded as a good substitute for barley. Banana starch passed into the intestine faster than barley starch, fermentation in the rumen was less intense and more regular, and less volatile fatty acids were released with banana rations than with barley rations. The latter observation is consistent with the efficient utilization of urea in both banana-based and barley-based diets (Poncet, 1973). An ensiled mixture of bananas, bagasse, wheat bran and urea maintained milk production in dairy goats and increased the growth rate in growing kids compared to animals fed a grain-based diet. The low DM intake (2.0 to 2.5 kg/100 kg live weight) increased by 30-40% after adding 5% molasses (Le Dividich et al., 1978). Waste bananas are traditionally used to fatten pigs, for example in the Carribean (Göhl, 1982; Klotz et al., 2002), or banana-producing areas of India (Buragohain et al., 2010). Due to their low protein content and their deficiency in lysine and sulphur-containing amino acids, bananas must be supplemented with additional protein.. When animals are fed high levels of green bananas, palatability affects voluntary intake and the lower consumption affects performance (Pérez, 1997; Ly, 2004). Pigs eat bananas with relish when they are ripe. The drop in intake with green bananas is due to the presence of tannins (Ly, 2004). Slicing and sun-drying green bananas improve consumption. Cooking green bananas improves palatability but growth rates are still lower than for ripe bananas (Pérez, 1997). Pigs fed mature bananas may choose to discard the peels unless the amount of bananas is restricted (Clavijo et al., 1975). In growing pigs, ripe bananas gave slightly better daily gains and intakes than ripe plantains, which may be due to the slower maturing and higher tannin content of plantains (Clavijo et al., 1975). Organic matter digestibility is about 70% for the whole green fruit, 90% for the peeled green fruit and even higher for the ripe fruit (Göhl, 1982). Ripe bananas are therefore more valuable for pigs, but large amounts have been found to cause diarrhoea in sows (Pérez, 1997). Fresh or dried green and ripe bananas can replace cereal grains in growing pigs, but inclusion rates higher than 20-25% of dietary DM depress average daily gain and feed conversion (Pérez, 1997). Relatively low levels are therefore preferable, even with banana meal (Ly, 2004). Growing pigs fed a banana-based diet can eat from 4-7 kg (at 30-60 kg live weight) to 8-9 kg (over 60 kg live weight) of whole green bananas per day, with protein supplements (Klotz et al., 2002). Banana silage is highly acceptable to the growing and fattening pig. Green banana silage has a depressing effect on the digestibility of dietary protein but has nearly the same feeding value as the ripe fruit. Ripe banana silage results in poor growth performance because of its high cellulose content. Carcass is good, including animals slaughtered at weights of 100 kg or more. However, the low DM content of silage could limit its incorporation rate. Green or ripe banana silage may contribute to 30% of the total DM intake from 30 to 90 kg live weight and 65% from 90 to 110 kg live weight (Sève et al., 1976). Fresh bananas should not be used in early weaning feeds because piglets are unable to digest starch from this source efficiently (Le Dividich et al., 1978). Banana meal, however, is a valuable piglet feed: a diet containing 50% of green banana meal fed to five week old weaned piglets controlled diarrhoea and resulted in growth performance comparable to that obtained with the same level of cassava flour (Le Dividich et al., 1974). 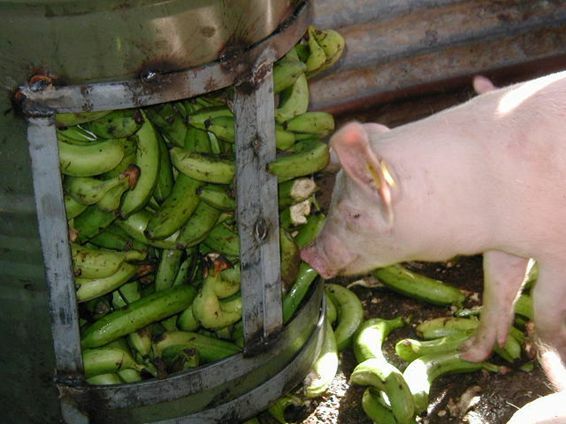 Gestating sows can be fed fresh or ensiled green bananas instead of cereal grains without altering litter size and piglet birth weight (Le Dividich et al., 1975; Clavijo et al., 1971b). Bananas are not advisable for lactating sows. Fresh ripe bananas did not meet their energy requirements, even when supplemented with molasses and a protein feed, and caused diarrhea when fed ad libitum (Clavijo et al., 1971a). 50% of green banana meal in the diet of lactating sows did not alter litter size at weaning but resulted in loss of sow body weight, which may affect future reproductive performance (Le Dividich et al., 1974). There have been few experiments dealing with banana fruits in poultry. Early research suggests that banana meal can be used in poultry diets but that no more than 5 or 10% of the grain content should be replaced by the banana meal, as higher levels are detrimental to growth and feed efficiency (Göhl, 1982). Indigenous chickens with free access to various sources of carbohydrates (broken rice, cassava roots, sweet potato tubers and banana fruit) ate bananas in small amounts and preferred the other feeds (Kong Saroeun et al., 2010). Whole green bananas were fed to rabbits ad libitum with a commercial pelleted feed. Rabbits consumed up to 120 g/day of fresh bananas (32% of dietary DM) and intake could have been higher if the amount of the pelleted feed had been restricted. The digestible energy value of green banana was estimated to be 15.2 MJ/kg DM (Gidenne, 1985). In South American characidae black pacu (tambaqui) (Colossoma macropomum) and red pacu (Piaractus brachypomus), cassava root, plantain fruit and peach-palm fruit (Bactris gasipaes) gave better growth performance than wheat bran and wheat middlings in diets containing 30% of the test ingredient (Lochmann et al., 2009). Freshwater prawns (Macrobrachium rosenbergii) were fed a diet containing up to 20% frozen banana fruits with no significant differences in final weight, yield and survival, though feed conversion ratio increased with the level of banana inclusion (Garces et al., 1993). Ripe banana fruits are a valuable feed for the African giant land snail (Archachatina marginata) since they promote growth. Green banana fruits may also be used but give lower results (Agbogidi et al., 2008). Klotz, S. ; Gau, D., 2002. L'engraissement du porc charcutier à base de banane verte. Livret Technique, CIRAD, 32 p.
Le Dividich, J. ; Canope, I., 1975. Chemical composition energy value and utilization of banana in swine feeding in tropical areas. Seminar on the Utilization of Local Ingredients in Animal Feedings Stuffs. Kingston, Jamaica, April 1975.